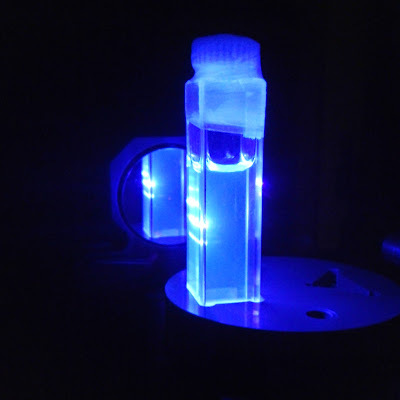 A new inorganic material using boron hydrides or boranes in a solution that emits laser light in the blue spectral region has been discovered. The discovery was done by researchers at the Spanish National Research Council (CSIC), Spain's largest public institution dedicated to research and the third largest in Europe. The newly discovered laser material has a higher degrading resistance making it last longer. Because of this. the borane solution is superior compared to other laser materials commercially available in the blue laser range. The high resistance to degradation also addresses occupational and environmental impact of these solvents since they are replaced less in the commercial setting. Liquid laser materials emit laser light similar to its organic rare earth materials like rubies. The light emitted by these have very high energy and are coherent. Coherent light travels in a straight line without scattering. In comparison, sunlight is incoherent light is it is scattered and not focused on one area or region. A flashlight is also incoherent light and travels in a "cone". The team of researchers plan to synthesize the boranes solution to emit at other wavelengths (colors), as this would lead to practical applications in dermatology such as tattoo, scar or acne removal, as well as treatments of vascular lesions. The work, published in Nature Communications, demonstrates that the new material presents efficient and degradation-resistant laser emission in the blue, a spectral region of interest in applications such as spectroscopy or materials processing, among others. The first laser was developed in 1960 and 55 years later, there is still a search for new materials that emit efficient, tuneable and stable blue laser light, that are, in addition, cost-effective, and easily produced and processed. "Nowadays there exists a diverse range of commercial materials that are close to fulfilling those requirements, but they present some practical inconveniences. In our study we present a solution that seeks to contribute to overcome these limitations," clarifies Inmaculada García-Moreno, CSIC researcher at the Institute of Physical Chemistry Rocasolano. Despite not being a novel material, this is the first time that the boron hydrides, or boranes, have been used to obtain laser light. "We have concentrated our work on solutions of anti-B18H22, a cluster-like molecule with architecture resembling that of a split soccer ball," says Michael Londesborough, borane specialist from the Institute of Inorganic Chemistry at AV ?R. Of all the laser materials known so far, boranes are, in terms of structure and properties, most similar to organic dyes, which emit laser light in an efficient and tuneable manner (very high energy with controllable colour), but that are easily degraded, necessitating the frequent renewal of the laser medium. The new borane laser material shows a resistance against degradation that is superior or similar to many of the commercially available state-of-the-art blue laser dyes. This high resistance against degradation means that the number of times the liquid medium has to be replaced is reduced, helping to solve issues with costs, occupational hazards and environmental impact due to handling of solvents, which are toxic and flammable. The team of researchers is planning to synthesize new boranes emitting at other wavelengths (colours), as this would open the doors to, for example, their possible application in dermatology (Tattoo, scar or acne removal, as well as treatments of vascular lesions, to name but a few potential applications). "There is still plenty of work to be carried out before these compounds can reach the commercial shelves, but the scientific relevance of this discovery represents a milestone in the history of lasers, since there are not many occasions in which a new family of laser materials is unveiled," concludes Luis Cerdán, a CSIC researcher at the Institute of Physical Chemistry Rocasolano. Dr. Michael Londesborough agrees, "We are highly excited by this discovery. The boranes, with their unique molecular structures and high photostabilities, present a new and previously untapped resource for laser technology."